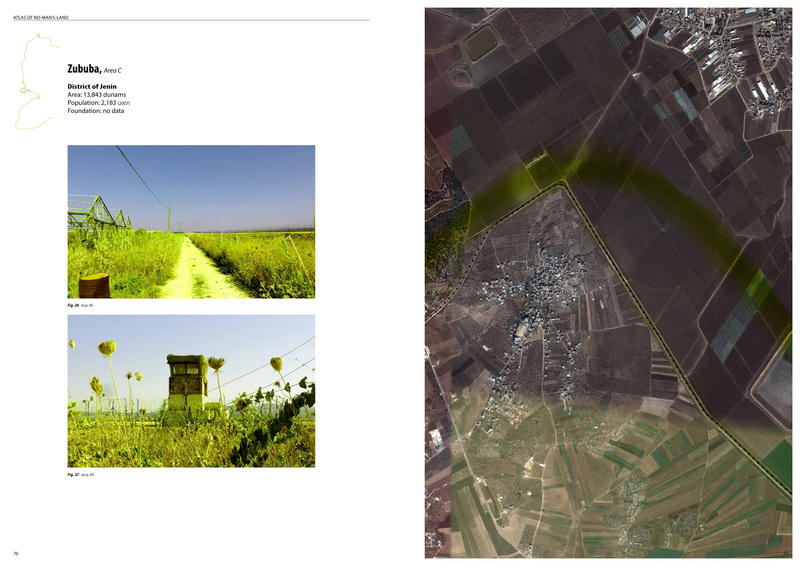 A few days ago, Orit Theuer, a recent graduate from the Vienna Academy of Fine Arts, shared with me her thesis project (2014) investigating the 1949 Armistice Line between Israel and the Palestinian territories on the West Bank of the Jordan River, which was under Jordanian control until the beginning of the Israeli occupation in 1967. This line is more known as the “Green Line” and Theuer’s work allows us to explore its path and debate of its hypothetical obsolescence. 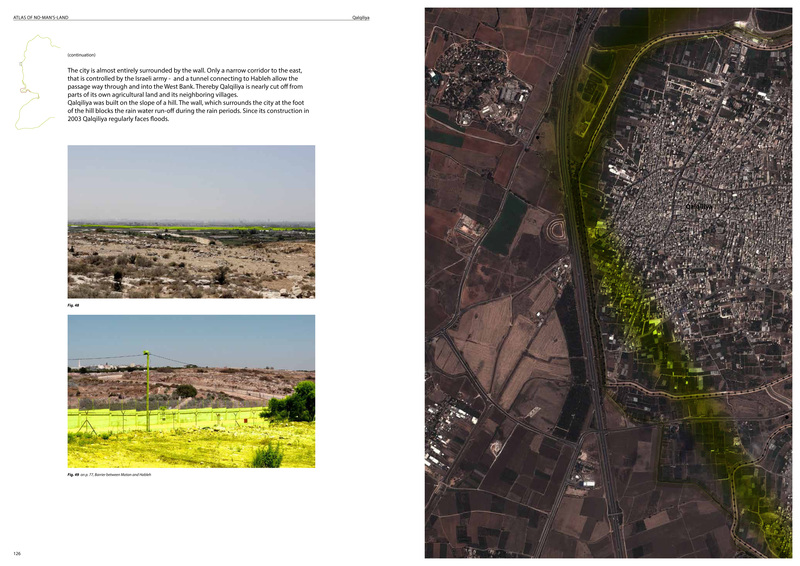 Many people who produce knowledge around the territorial struggles at work in historic Palestine, experience a fascination for cartographying their spatial components. 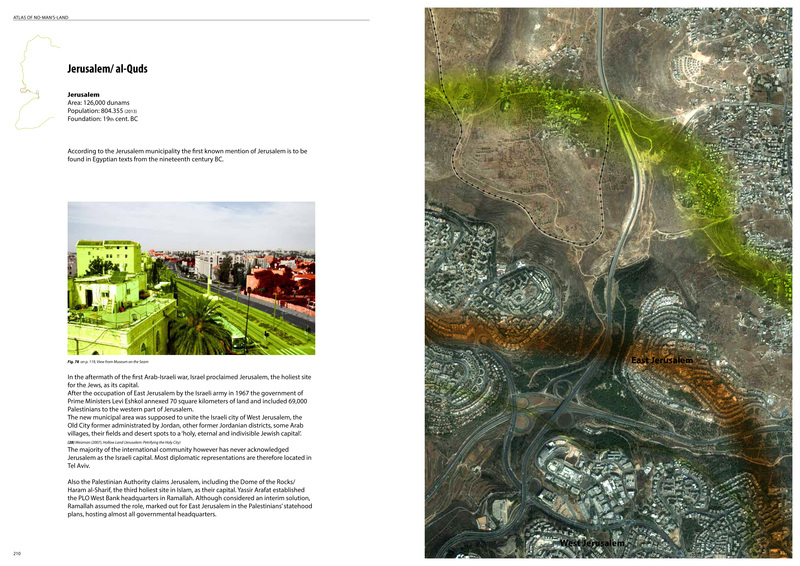 Nevertheless, maps and aerial photographs can potentially disincarnate the issues at stake if they’re not complemented by other documents ‘on the ground’ bringing the viewers to the earthly realms of bodies and materiality. 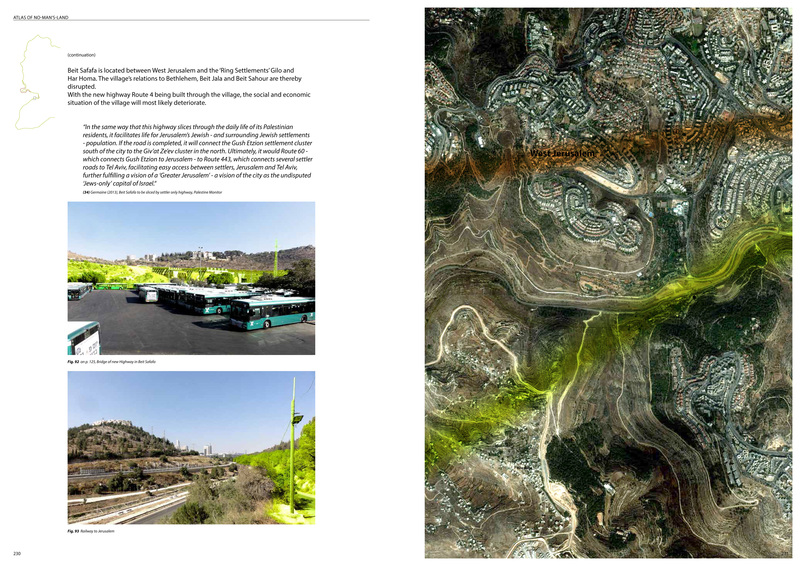 Theuer thus undertook to drive as close as possible of the totality of the Green Line path from its North intersection with the Jordan River, to its Southern one with the Dead Sea (see map below) and associated photographs she took to each aerial view of the Green Line. 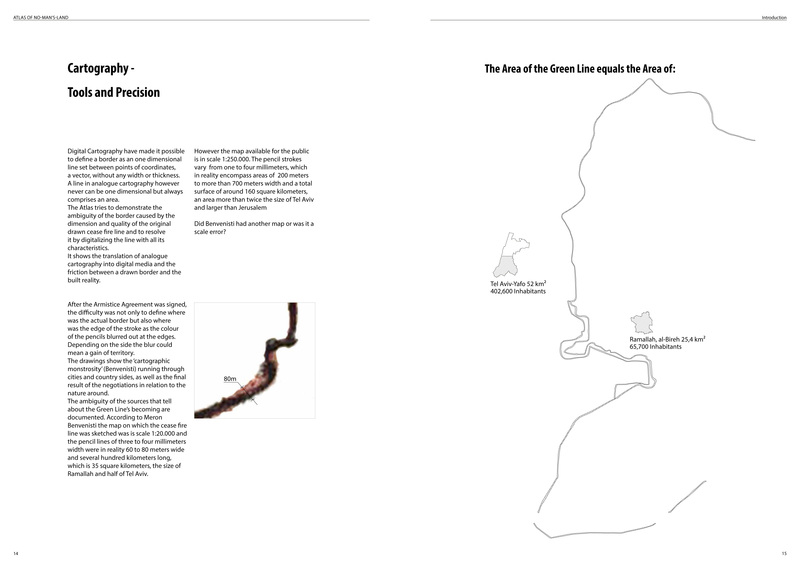 Her main site of investigation is less the territories on both sides of the line than what I like to call, “the oxymoronic thickness of the line” (see the 2010 graphic novel Lost in the Line as one instance of it) and the ambiguous legality applied in it. 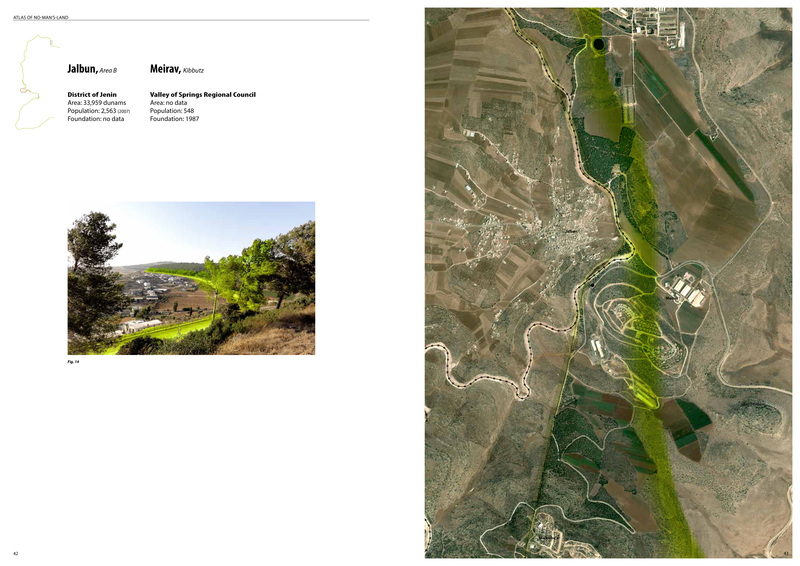 A similar approach in Palestine has been undertaken by Decolonizing Architecture Art Residency directed by Sandi Hilal, Alessandro Petti, and Eyal Weizman in their research “The Lawless Line” (2010) about the West Bank areas’ lines as defined by the 1993 Oslo Accords. 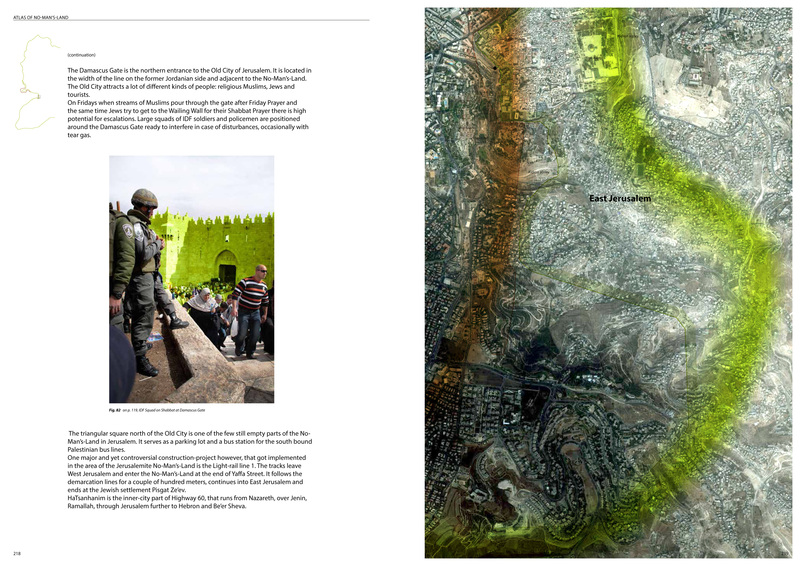 As Theuers reminds us in the beginning of her Atlas of No-Man’s Land, the Green Line was originally defined by both the Israeli and Transjordanian commanders of Jerusalem in 1948, respectively Moshe Dayan and Abdullah el-Tell. Drawn in precarious conditions considering the future impact of its path — the story goes that it was either on the ground or on a military jeep’s bonnet — the line could not acquire the mathematical ‘purity’ that its definition entitles (a line has no thickness) since it was drawn by “three to four millimeters wide” grease pencils. 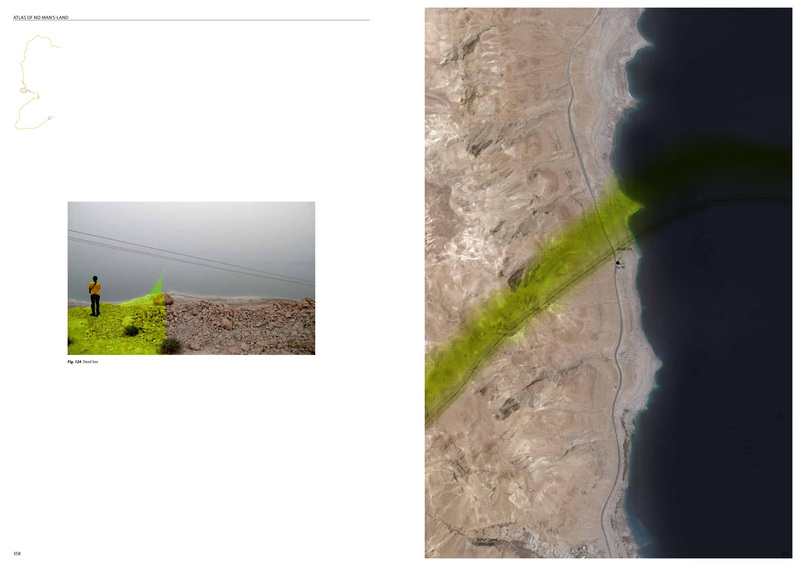 Based on the scale of the map on which it was drawn (1:250,000), the thickness of the line is no less than 80 meters, a substantial space of legal ambiguity. Moreover, this thickness increases with a significant degree in the region of Jerusalem where the line occasionally splits (another oxymoron) into two between Dayan and el-Tell’s paths (in red on Theuer’s maps). As Theuer recounts, the zone between the two lines has a real juridical precedence in the ambiguity it constitutes as the 2003 trial “Eitan Kramer vs. The State of Israel” attests. 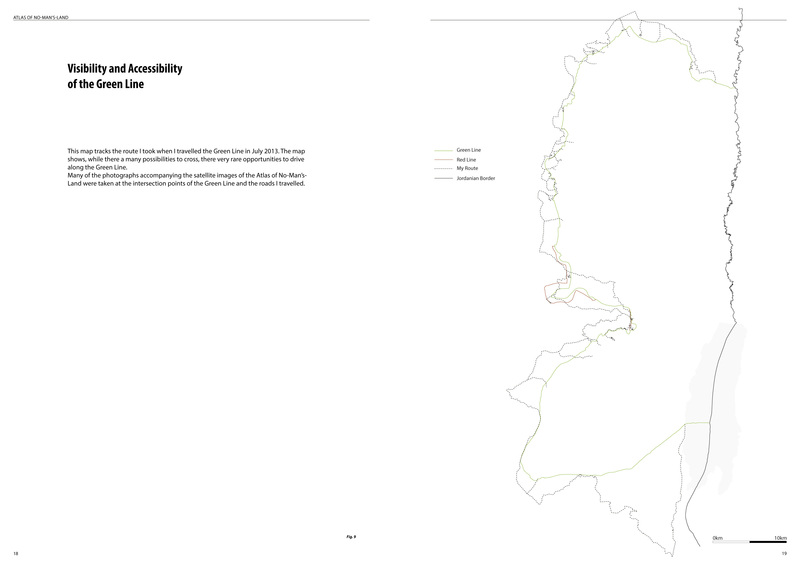 The 168 pages of the Atlas of No-Man’s Land reconstituting the totality of the Green Line’s path show us the paradoxical ‘full-ness’ of the line’s thickness: towns, fields, roads occupy its liminal space despite the lack of legal definition proper to it. Similarly to maps disincarnating situations, asymmetric agreements can be misleading if we think of them as applied realities. 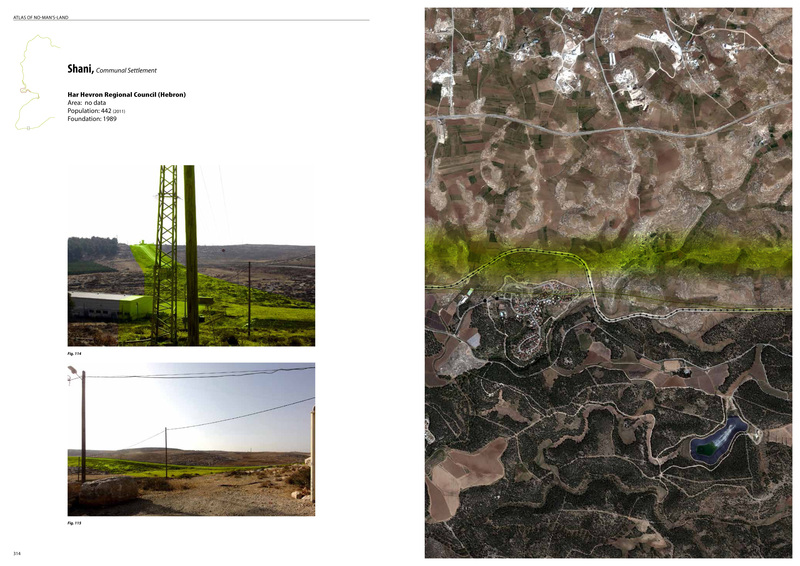 We therefore have to use Theuer’s work in a critical manner to wonder if the Green Line stills correspond to any reality ‘on the ground,’ and whether it is still a relevant line to consider in the Palestinian struggle for existence in historical Palestine. 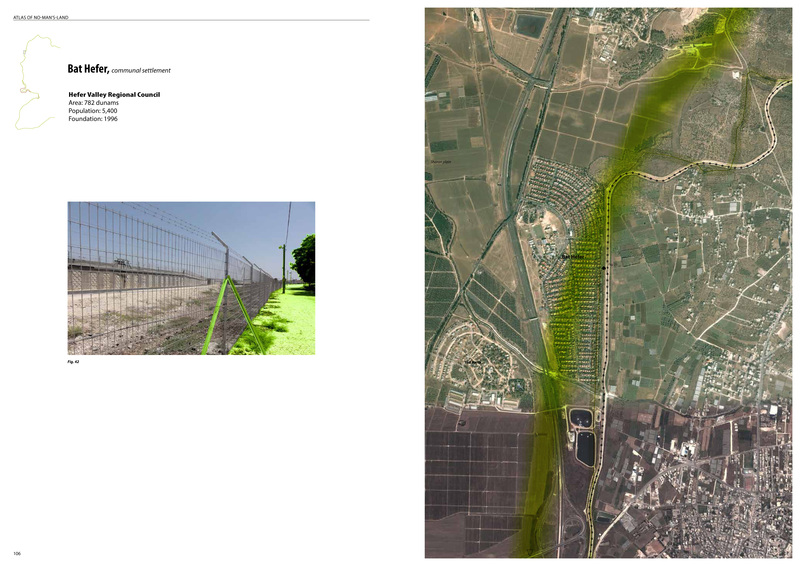 Since 1967, the Green Line is supposed to characterize the separation of Israel’s sovereign territory and the territory of its army’s occupation. 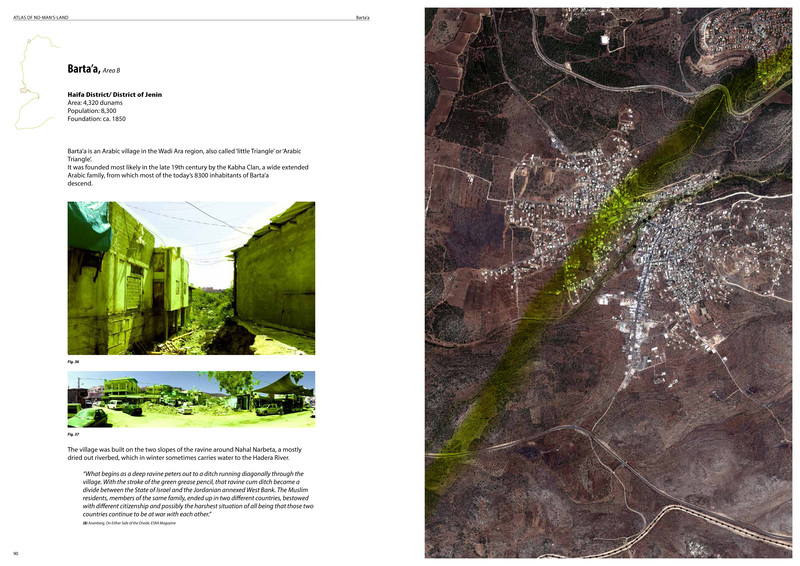 The construction of about 150 settlements in the occupied territories, where more than 600,000 Israeli civilians currently live (the settlements in the Gaza Strip were evacuated and demolished in 2005) rendered the reality sensibly more complex — I am not talking of the problem from a legal point of view here — as did the erection of 500 kilometers of the so-called “separation barrier” that attempts to run as east as possible in the West Bank to connect the largest amount of settlements to the Israeli territory. Settlements’ inhabitants, whose presence in occupied territory violates the Fourth Geneva Convention, do not abide by the Israeli military legislation and judiciary system as Palestinians do, and the multiplication of such different legal and administrative treatment on a same territory, depending the ethnicity of the considered bodies, fully corresponds to a situation of Apartheid. 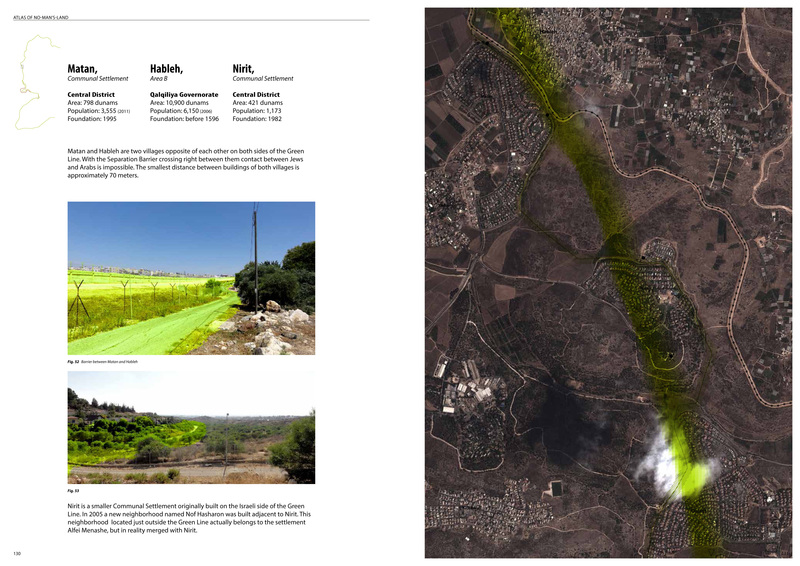 Through a forty-year-old politics of colonization of the West Bank as well as the last fifteen years intensification of Apartheid spatial apparatuses, Israel has rendered the Green Line obsolete. Although, we can and should be outraged by the overwhelming power deployed on the Palestinian lives by the Israeli government and army, we would be seriously mistaken to wish for a return to the 1949-1967 situation, as the recent prospects for a Palestinian State pretend to incarnate (see past article). It is in the interest of the Israeli government to pretend as long as possible that it is not interested in the two-states so-called “solution” (see past article about this notion) as Benjamin Netanyahu has affirmed two days before the last elections before retracting himself shortly after he won the latter. Such a scenario is nevertheless in its long-term advantage. Every move by Israel to withdraw back to the Green Line will be perceived as a substantial effort to head towards an illusory peace, when they would merely correspond to the conformity to the International legislation, unrelated to the past sixty-seven years of oppression. 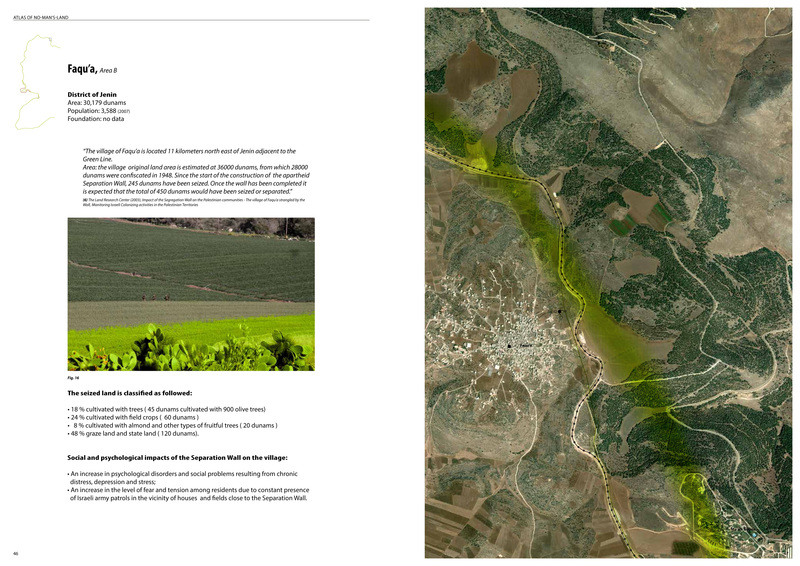 The Green Line thus materializes an horizon for the opportunistic Palestinian Authority to reach as a sign of victory, when the establishment of a Palestinian state within the 1949 borders. Such a scenario would legally legitimatize the ethnic cleansing that created the State of Israel on a land to which about 5 millions of Palestinian refugees await to go back in the overpopulated camps of Lebanon, Syria, Jordan, Gaza and the West Bank. The prospect of a common state for all “from the Jordan River to the Sea” as the adage goes, on the other hand, only requires consideration for the Green Line in the judgment of the Apartheid politics of the State of Israel until the creation of such a common state (whether it is done in the context of a “Truth and Reconciliation Commission” like in the 1990s South Africa or in more classic or imaginative forms of trials). It is thus important to stop considering the Green Line as the fetish of a regretted past used in useless and asymmetrical negotiations and, instead, to use it as a strict legal instrument deprived of a future.